I started working with leather about 40 years ago. My family was saddlers and cobblers so I was actually bought up knowing the trade. And many other aspect of training. I have commissioned numerous things from full size and miniature Western Saddles. such as; Washers for Wells to Gaiters for Russian Army trucks. Jewlnick Leather is a Husband & Wife run business. We're customers satisfaction is important to us. The main product we sell today is Swarovski crystal Dog Collars and Leads. Anything you need and any style you require. We try to oblige to your needs. and is all HAND stitched. I make every thing myself with a little help from my wife. and there is only one of a kind on some of them! 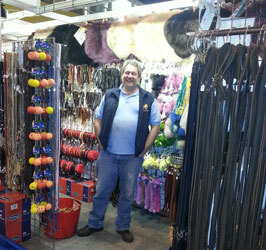 We have Crystal Leads for every day and also stunning Show Leads. If you have a particular style and cant find it, try us we might be able to make it for you. If there's anything you need and can't find it give us a ring we might be able to help.